For example, a new report by the National Centre for Social and Economic Modelling (NATSEM) is said to show that women would be the hardest hit by the Government’s super changes. But taking a step back it is clear that the Government’s super changes will overwhelmingly affect rich old men, while better targeting super tax breaks at the objective of superannuation. The NATSEM report examines the impact of two of the changes to superannuation announced in the 2016-17 Budget. First, the annual cap on pre-tax contributions will be lowered to $25,000 from its current level of $35,000 for over 50s, and $30,000 for everyone else. Second, contributions will be taxed at 30% rather than 15% if a taxpayer’s income is more than $250,000, rather than the current level of $300,000. To assess the impact of the super changes, NATSEM models the increase in tax paid by those affected by the changes, as a proportion of their incomes. It concludes that among those affected by the changes, women aged 50 and over would pay the biggest increase in tax as a proportion of their incomes. NATSEM reports that women aged 50 to 64 that are affected by the policy changes have median incomes of $112,732. Women aged 65 or over who are affected have median incomes of $79,602. However, this overreaches. The analysis does not prove anything so broad. All it shows is that as a result of the policy changes, superannuation will provide less encouragement to some women aged over 50 from contributing such large amounts before tax to superannuation. Any assessment of who is affected by a policy change requires us to know both how much people are affected, and how many are affected. NATSEM’s commentary focuses on the former. 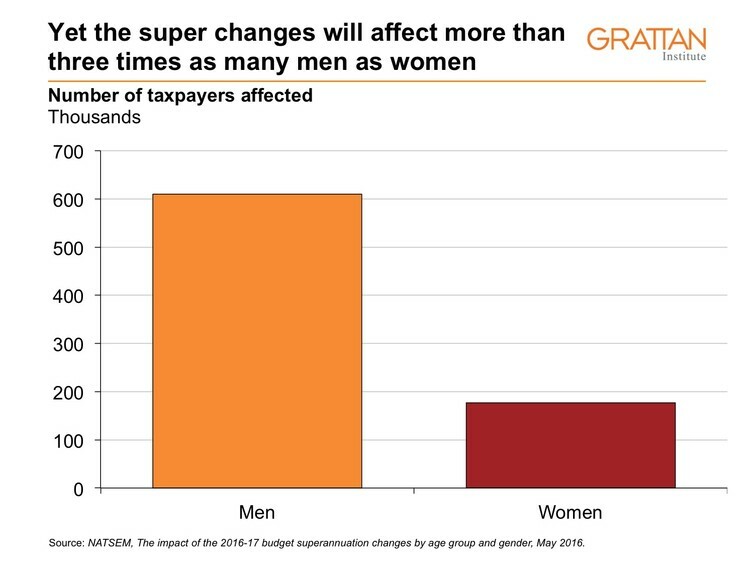 However, as NATSEM’s own figures show, the super tax changes would affect more than three times as many men (610,000) as women (177,000). To understand the overall impact of the change, one must examine how much of the extra tax raised by the changes would be paid by women, compared to men. 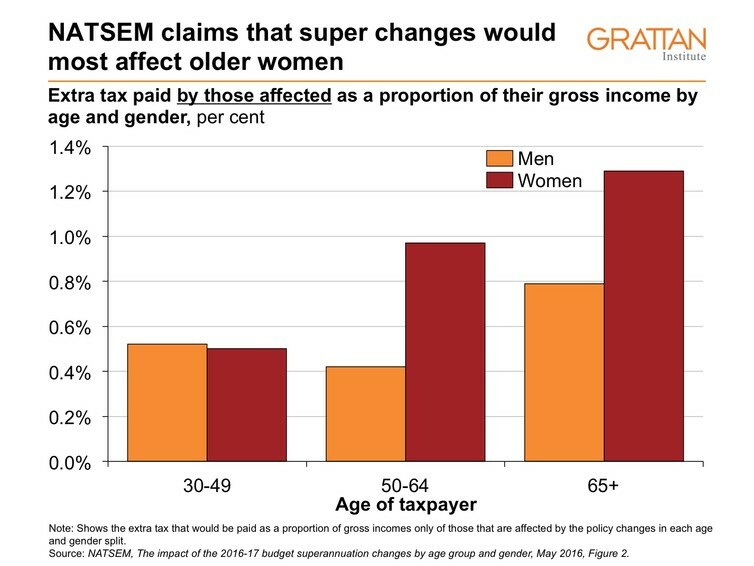 NATSEM does not publish this analysis, but given that many more men than women are affected by the super changes, and that the men affected on average have higher incomes, it’s very likely that most of the extra tax will be paid by high-income men. NATSEM’s report also misses the bigger picture. As with much distributional modelling, NATSEM’s approach highlights the losers from the tax changes, but does not highlight the benefits for everyone else. Other taxpayers will have to pay less in other taxes – both now and in future – once super tax breaks are wound back. It’s true that the new lower $25,000 cap on contributions may prevent some low- and middle-income women from making catch-up contributions of more than $25,000 a year to their super. Yet this group will be small, because very few women make such large catch-up contributions to their super funds. Even among those low-income earners that do make large super contributions, many are likely to be the partners of high-income earners. In addition, the five-year “carry forward” provisions that allow catch-up contributions will reduce the effect on low-income women although they will primarily benefit higher income men. At present, just 3% of women make catch-up contributions of more than $25,000, compared to 5% of men. Of those that make such large contributions, two-thirds are among the top 20% of income earners, most of whom are unlikely to ever qualify for an Age Pension. 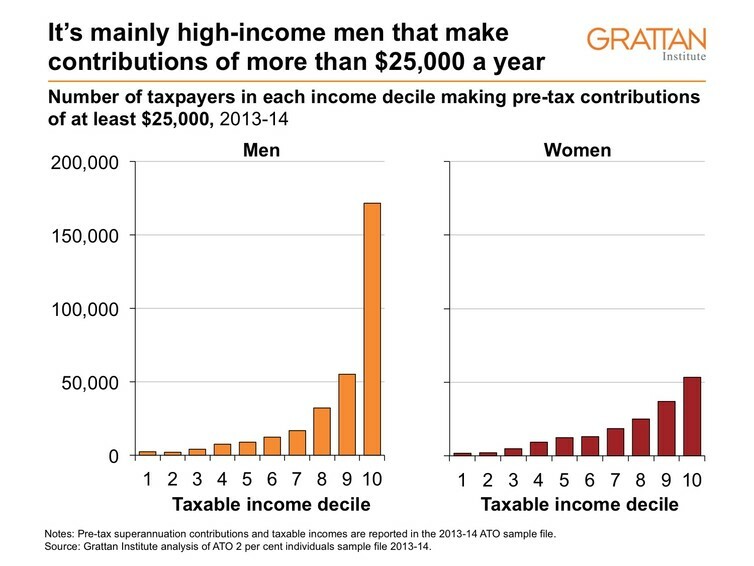 Most of those who benefit from the existing tax breaks are men with higher incomes who have sufficient disposable incomes to make such large contributions to super. The overwhelming winners from the proposed changes will be those who do not make such large contributions. They will generally have lower incomes than those who are affected. In addition, more of them will be women. The Government’s super tax changes will better target superannuation towards its core purpose of substituting or supplementing the Age Pension. As our recent Super Tax Targeting report shows, superannuation tax breaks cost more than $25 billion in foregone revenue, with more than half the benefits flowing to the top 20% of income earners, people who already have enough resources to fund their own retirement. Although it doesn’t go far enough, the lower $25,000 cap on super contributions strikes a better balance between allowing those with broken work histories to contribute towards a reasonable superannuation balance, while restricting the opportunities for tax minimisation by those unlikely to qualify for an Age Pension. Distributional analysis can improve the quality of policy debate. However, it should be applied with care. NATSEM’s analysis of the Government’s super tax could easily mislead. In fact, the Government’s super changes will overwhelmingly affect rich old men. More importantly, the Government’s changes will better target super tax breaks at the objectives of superannuation, reducing their cost to all taxpayers. See Also: Can Company Tax Cuts Really Benefit Australians?